In 2017, the Carbon Disclosure Project (CDP) recognised us as one of the leading oil and gas companies on the Climate A List. We are heading increasingly towards the decarbonisation of the energy system. Natural gas represents an opportunity for us to strategically reposition ourselves, given its lower carbon intensity and the possibility of integrating it with renewable sources in the production of electricity. We want to invest in the methane supply chain in order to continue to reduce CO2 emissions. 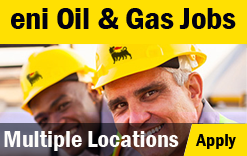 Eni published their latest job opportunities in various department. Interested candidates can apply now.